If you could have that day over again, was there an alternate route that you could have taken in there morning that might have given you a faster or more pleasant journey? An extended “bustitution” will definitely require dedicated albeit temporary bus lanes to cope with the amount of passengers that would normally occupy a number of trains. It should be worth mentioning, I don’t know about the city unis, but Monash Caulfield’s mid semester break is after Easter when the buses finish. So I think they are limited in how they could shut those roads, also meaning that there is a lot of non-transferring passengers. Given the amount of people I know taking the days from Easter to Anzac off (I just got an email from my boss today encouraging it!) even though it’s not school holidays I wonder if it should have all been delayed a week. On Monday, the impact would have been worse, with the Vegan blockade in the city. Frankston line, you could have buses running Morabbin – Arts Center. These are more direct, have one main road straight in too. What can you tell me, in respect to the impact on local tram services? Are trams running more frequently, or are higher capacity trams being used. I would prefer using the #3 tram, especially if nobody else is. 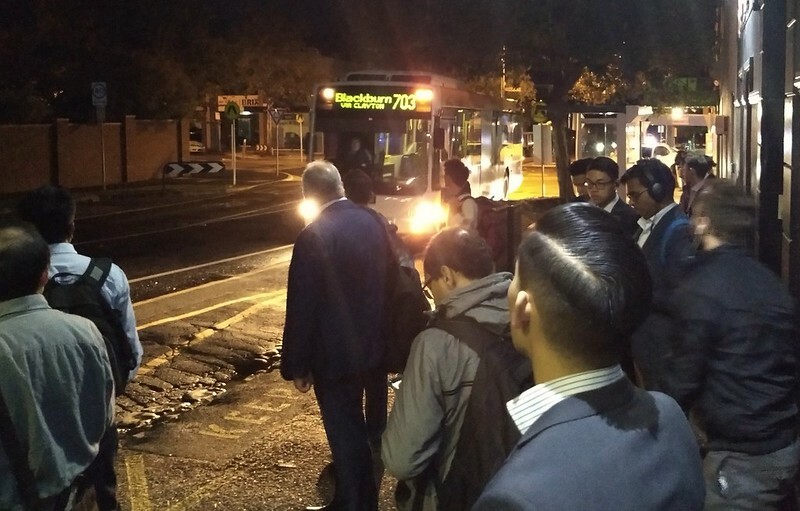 Is it wise, for the buses to use the Monash? I would have said, that Dandenong road would be much quicker, and perhaps not as busy as the Monash Freeway? I know of many, who would normally take the train, are in fact driving. Including into the city. The Monash is at the best, very busy in peak, it can only be somewhat worse now with many more automobiles on the road. @Alex, the 703 to North Brighton then Sandringham line would have been far, far quicker. But then I wouldn’t have such good photos for this blog! @Jessica, thanks for that. 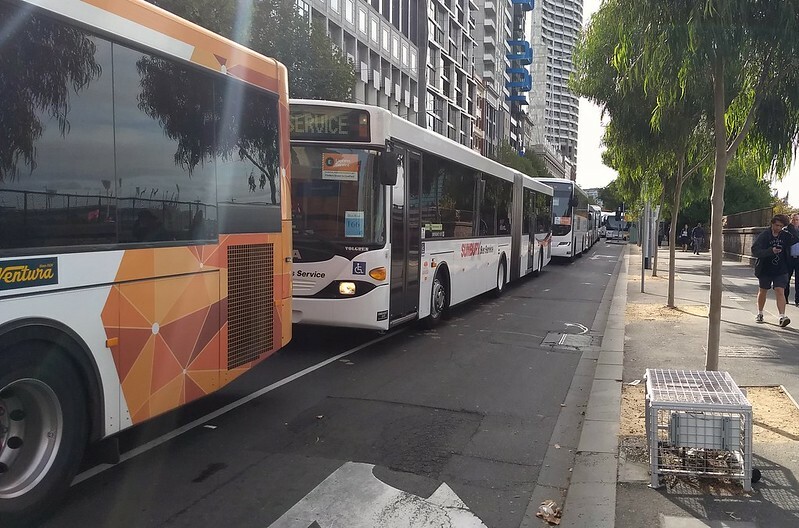 There is more they could have done, such as banning (or discouraging) through traffic, or only permitting cars one way along Normanby Road and Sir John Monash Drive, to allow more space for buses. @Jim, I know this is a long post, but virtually every question you’ve asked is covered. In particular I have explained why the Vegan protest would not have impacted the buses. The Sandringham line had a paltry two citybound services added temporarily in morning peak, so from Elsternwick between 730am and 9am, a train leaves about every 6.5 minutes rather than 7.5 minutes. Still better than the Glen Waverley line which had no services added at all. There are still two weeks to fix this. Perhaps a change in off-peak frequency from 15 minutes to 10 minutes for both lines would help encourage fewer people to travel during peak too, especially if it’s properly promoted. 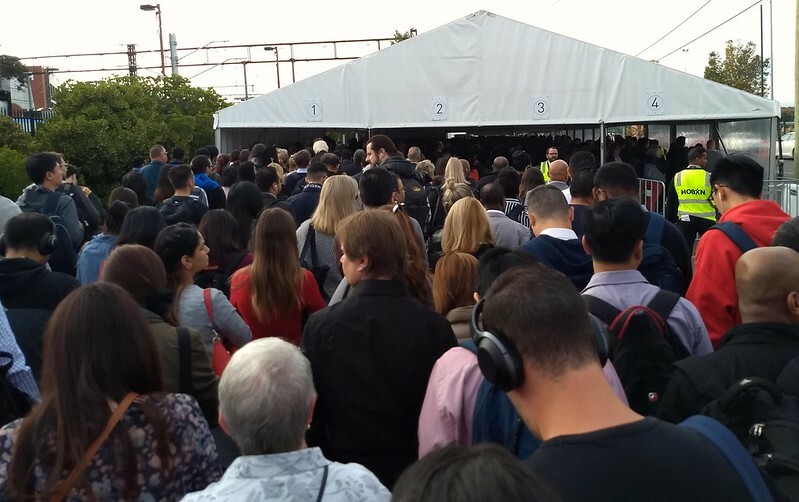 I’ve chosen to leave home earlier (I travel in from Frankston all the way to the city), and leaving work earlier and have been able to avoid queues at both ends of the day. Mind you the train from Frankston to Caulfield on it’s own is taking an hour, so that’s a bit frustrating. But it’s all for the greater good, and I have a supply of books to keep me occupied during the disruptions. Re Caulfield, there have been staged changes over the last few years. One of the negative outcomes of the Skyrail+HCMT projects is the nerfing (bordering on castration) of Caulfield, Oakleigh and Dandenong. December 2018 – Points 608U, 608D, 610D, 652 & 662 abolished (Caulfield PL04 down end, and remnants of PL01/02 to Dandenong); 632 and 642 replaced with left-hand turnouts (might’ve still been a custom design given the curve radius?). The removal of points 608 was supposedly to permit extending Platform 4 for the HCMTs, but there is room at the up end for that extension so that excuse doesn’t make sense. Of course, when the ten-car sets come in the whole area’s going to need to undergo major changes anyway to permit 250m-long, entirely straight platforms. I suspect that the western third of Sir John Monash drive will need to be abolished, with Route 3 returned to the Dandenong Rd alignment and the Smith St junction moved to the up end of the bridge (if not abolished completely). I would also argue that even if PL04 did need to be extended slightly in the down direction, that was not an excuse for removing 608 completely; rather, 628 could have been converted into a double slip/compound, with a new 608U roughly parallel with the former site of 610U. 611 would need to be shifted, either converted to a delta/scissor with the new 608, or moved to the down end of the Queens Avenue bridge (requiring shifting dwarf CFD711). And of course there is no good excuse whatsoever for removing 613/623/633/652/662. It was done to make the tie-in with the realigned skyrail bridge easier, but even taking that into account it wasn’t necessary. Would a bus bridge from Murrumbeena to East Malvern be better than what you have suggested from Westall? The distance is only 1.5 km, enabling buses to do many trips within a single peak period. At a pinch the distance could be walked. Both stations have car parks large enough for tents and waiting facilities. Bus lanes are the way to go. 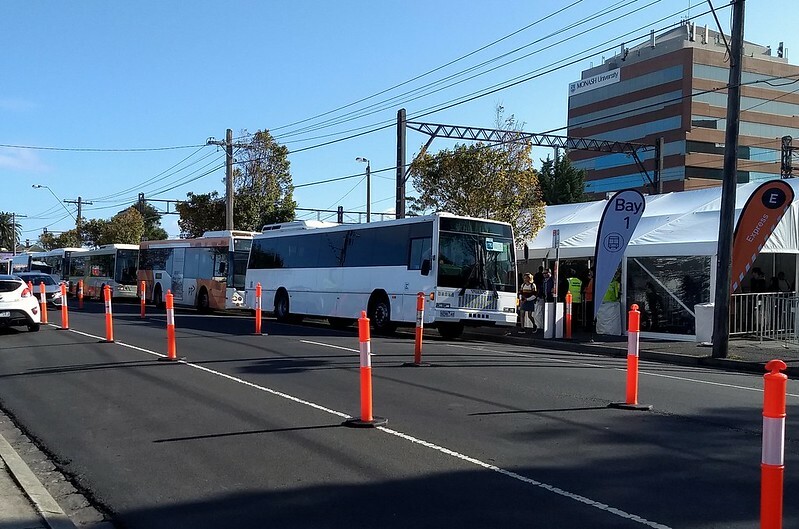 PTV have planned for bus lanes before, like when the Sunbury line was shut down and most of Ballarat Road had a single dedicated lane for transfers between Albion/Sunshine and Flemington Racecourse. They used temporary flashing signs and repainted the roads very quickly so that the other drivers knew what was going on. It was convenient, easy to use and more importantly, could handle the extra numbers of university/school students because it wasn’t scheduled on a school holiday like it is nowadays. 1) Who would know? No signage to indicate this at my station, Brighton Beach.The timetable on view at the station is the normal one. 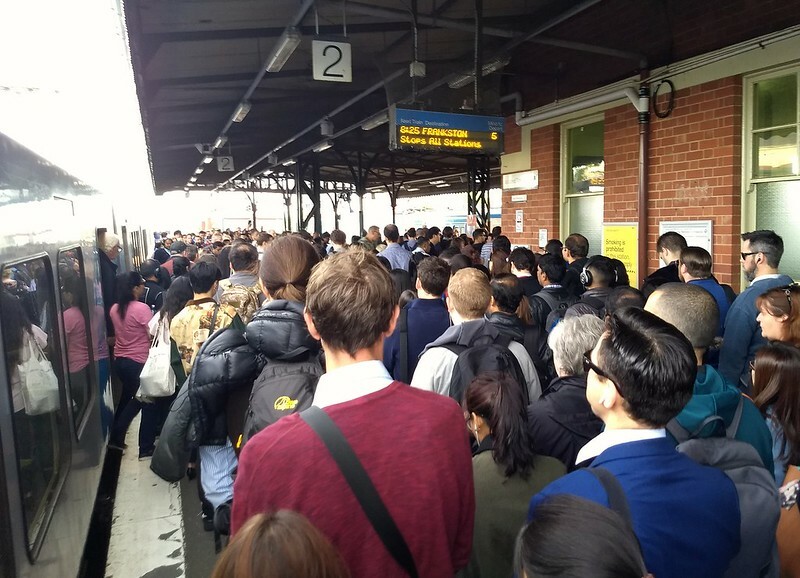 2) Normally there is a 5:16pm followed by a 5:23pm Sandy train from Flinders St – a gap of 7 minutes. With the “extra services”, this has become 5:17pm, followed by 5:29pm – a gap of 12 minutes. Why has the gap increased? Now many people can’t get on the 5:29pm (this is the origin station). Who programmed this timetable? I’ve found it easier and quicker to get off the train at Murumbeena, and walk to East Malvern on the Glen Waverley Line. It is only 1.5 Km, so its taking 18 – 20 minutes (depending on how stuck I get at the lights crossing Dandenong Road). I have noticed progressively more people doing the same thing this week. There were 1 or 2 others earlier in the week, but around 15 this morning. The Glen Waverley Trains are Packed though, as is the carpark at East Malvern, as well as the surrounding side streets. It seems a lot of commuters who normally use the Dandenong corridor are driving to somewhere on the Glen Waverley line instead. And changing at Richmond for a loop train is a nightmare, since only the Belgrave/Lilydale trains are running. 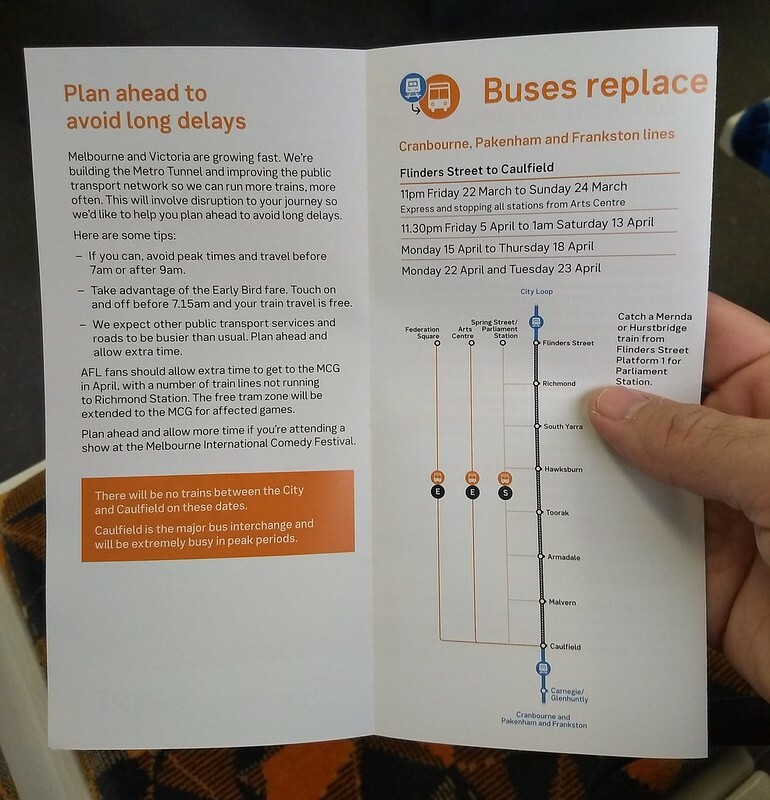 As you have mentioned, buses really are not a good substitute for trains, and Caulfield to CBD is probably the most tricky route for substitute buses. So I’m puzzled why they haven’t provided a bus bridge between Moorabbin and Brighton Beach, and increased Sandringham line services to 10 minute frequency. 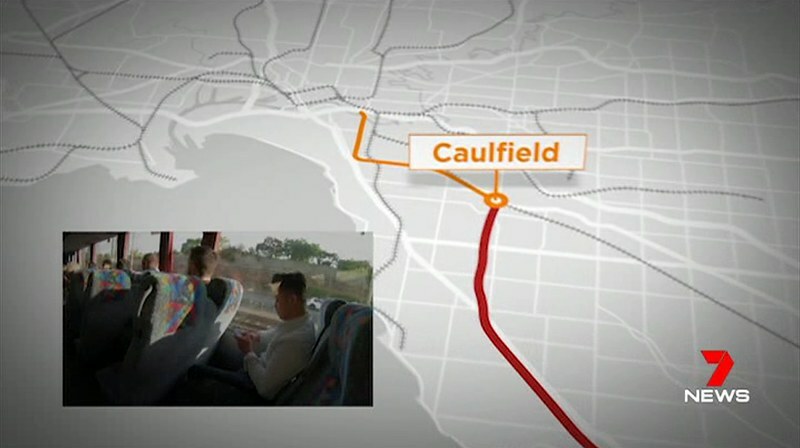 It was very successfully done during the last big shutdown, and would take a large load off the demand for buses at Caulfield. Adding to the comment on the bus bridge to the Sandringham/Glen Waverly Lines, can we also install temporary bus lanes on some of the roads the bridge runs on, and not only speed up the bus bridge on those road, but also see how it affects patronage on the other bus routes that happens to use it? And maybe make the bus lane designations permanent depending on the analysis of passengers vs private cars? Certainly the morning peak needs more services too, even if it’s only the 30-60 minutes leading up to when it runs at a 7 minute frequency. I’ve caught the 7:39am ex Tooronga twice this week (previous train 12 minutes earlier, but following trains for next hour run at 7 minute frequency) and it’s been at absolute crush load. On a normal week there’s usually plenty of people standing, but also enough room to move from one end of the carriage to the other. no point going to brighton beach if you have to walk 800 metres to the station. @enno, what are you talking about? I am talking about the bustitution in January. walked past 2 bustops because the residents didn’t like it, apparently. with some luggage and a disability, almost killed me. From Hughesdale station to the Alfred Hospital has taken me 1.5 hours each way last week which is double the usual 45 minutes (train to Sth Yarra plus walk). I used the stopping all stations replacement bus to Hawksburn (plus a walk) or South Yarra (plus a walk). I’ve also been dropped at the 67 tram stop off Koornang rd. The 67 tram was crowded by Glenhuntly, but getting on at the end at least means you get a seat the whole way. I’m thinking of the no. 3 tram from Caulfield as an alternative to the buses. Currently enjoying my last train ride on the Geelong line for the week. Hopefully the coaches work fine for the next three days. Unsure why the express coaches stop at Footscray on the way out to Geelong but not on the way back to Melbourne – so it will be into Southern Cross in just over an hour, and then back to Footscray on either the train or the 216/219 bus. If I’m a glutton for punishment, there’d also be the stopping all stations option, which is timetabled to take 2.5 hours from Geelong to Footscray! @enno I agree, the buses seemed to stop a long way from Brighton Beach station. As far away as Xavier College, near Hartley St, about 350m walk from the station. They often queued back from there to Esplanade Ave, near the U-turn point on South Rd, so some people got lucky with a shorter walk. Why South Rd? It seems to sensibly be the point of quickest turnaround for the large number of buses, without getting stuck at the level crossing or having to deal with Beach Rd traffic.